Control by integral PIR detector. Fan is switched ON when PIR is triggered. Built-in overrun timer, variable from 5 to 25 minutes, switches fan Off. 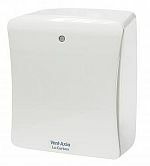 100mm high performance centrifugal extract fan for internal bathrooms, WC's and other small rooms. Single speed, dual speed and overrun timer models. Exclusive Variatronic HP2 automatic humidity control circuitry/variable speed. 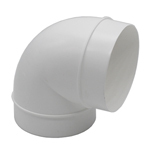 Designed for use with System 25 flat duct (remove spigot). Mains unit complete with recessing kit. 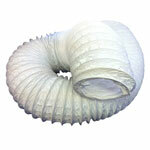 Designed for window, wall or ceiling mounting. 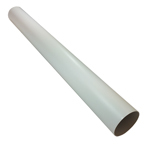 Can be used with System 25 flat or round duct. Integral humidistat, timer or PIR versions available. 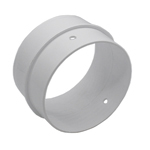 Rear 20mm conduit entry for recessed wiring or side grommet for surface wiring.